Napier Port is in Napier, New Zealand, on Hawke Bay. It is the North Island’s second largest export port by tonnage, and is owned by the Port of Napier Ltd. The port is connected to the rail network via the Napier Port Branch (Ahuriri Branch), and it hosts dozens of cruise ship visits each year. In 2014, the 138,194 tonne MS Voyager of the Seas visited the port, which was the joint 21st largest passenger ship at the time, and the largest to ever visit. Napier is an important service centre for the agriculture and pastoral output of the predominantly rural Hastings District. The port handled 157,700 containers (roughly 9% of all containers handled by New Zealand ports) in the 2015 calendar year, behind the ports of Auckland, Tauranga and Lyttelton. 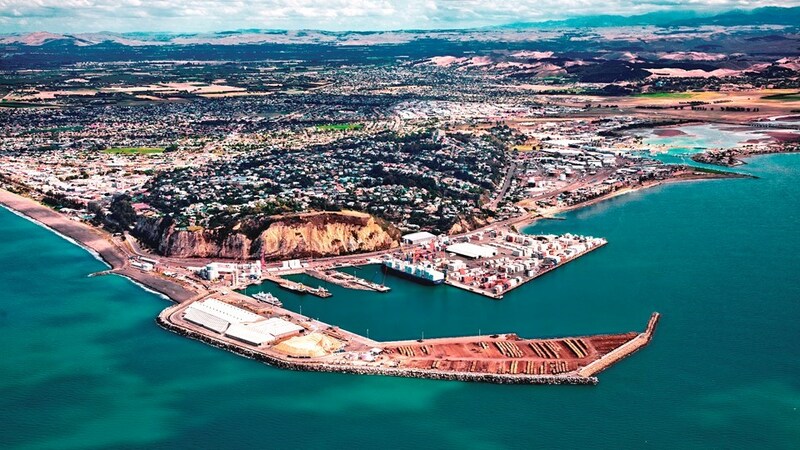 A new wharf is currently being planned (as of early 2016) to handle projected volume growth and larger vessels, and will be the port’s largest ever single investment, at $50 million NZD. 1876 – The vessel Caberfaioh berthed in the Inner Harbour with full shipment of hardwood piles. 1879 – Captain France Amades, master of the steamer Pretty Jane, was granted the first Pilot’s Exemption Certificate for the Port of Napier. 1895 – Opening of the timber constructed Glasgow Wharf. 1931 – Earthquake destroyed both the town and port. 1989 – Following the Government’s port reform process, Port of Napier Ltd commenced operation. 1990 – First mobile container crane purchased. 1994 – Container Depot established on port. 1995 – Purchase of second mobile container crane. 1997 – Opening of new wharf “Cassidy Quay”. 2002 – Purchase of 3rd mobile container crane and new tug “Ahuriri”. 2009 – Completion of No.4 Wharf berth re-development and reclamation.